Zen Cart + Best Ecommerce Practices = More Sales. Here’s the Proof. Ok, as many of you know through my posts at the Zen Cart Forums as well as from reading my site here, I talk a lot about how to implement various strategies that combined can increase sales for you. It hit me square in the head that I should show you that what I am talking about DOES work (and can work for your store too). Let me make it clear that there are various components that go into increasing sales from any e-commerce site. It’s not all about “the product” or “the traffic”, or all about the design; sure, those are critical elements, but it’s much more than that. It’s about the “entire package” from the moment a potential customer sees your search engine listing (whether paid search of organic seo) to the moment they complete the process of buying from you. It’s all part of the “Total Customer Experience”. If you haven’t read my post yet on “The Online Customer Experience“, then you may want to go over that sometime. In future posts, I will go over the various components that combined will help you achieve more from Zen Cart (the SALES way). But that’s for another time. Right now, I want to show you some real screen shots of results from one of the many “Zen Cart” sites I have worked with (yes, I am available for contract work if you need it. Contact me and we’ll talk.) I have whited out various items (name, domain, etc…) to protect the privacy of the owner, however, many of you can see from these images that they are taken directly from the Zen Cart Admin section and Google Analytics. In case the reports don’t look familiar to you, they come directly from the new BETA Reports section Google just added this week to Analytics. Now, the numbers I showed you there are for all of 2007 (to date as of this writing). The numbers I am showing you below are taken directly from the Zen Cart Admin “reporting” section (“Sales Report” contribution, although I have an older version running here), and detail the total sales generated since the day the site was launched (using Zen Cart). Let me say that this particular client had NO web presence before this (so, they were starting a “ground zero” with not a single customer). This was their first e-commerce site. I mention it because I want you to see each month how the sales steadily increased, and then jumped (this was due to a number of traffic / seo strategies I provided as well as implementation of principles I learned over the first few months using Google Analytics). See the difference a properly installed and properly analyzed tracking system can make! Also note how the # of orders is steadily increasing from month to month (a sign of continued growth). So now I have shown you that you can make more sales using Zen Cart, your task is to go out and do it! Using this website, mini-books I am working on, and various modules I am working on, I intend on continually showing you new ways that you can make it work. I am always testing. When I find something that works, I typically post it so don’t forget to subscribe to my feed (it’s free) and / or bookmark this site so you don’t miss out on anything. Now it’s your turn. Tell me your thoughts on what you would like to see (not already built) to help you increase sales from your store. And if you want a contractor to help you get there, drop me an email or give me a call. One question on this: do you attribute this solely to the work done on the site or partly due to the nature of the product itself? Have you looked at conversion by new vs. returning customers? I’m pretty sure I know the product sold on this web site and it lends itself to reorders…would be interesting and might be a better KPI to measure only new visitors. Just my .02 and food for thought…good stuff! Good question, and one that rightfully should be addressed. This is more attributed to the work done on the site than to the product itself. Sure, a product in a higher demand market will naturally generate more traffic (which depending on the average order value, could result in more or less revenues). However, if the traffic was not qualified, it wouldn’t matter anyhow. On the other hand, if the traffic was qualified, and the site was not setup correctly, the growth would not be as quick, and the conversion would not be as high. On the site I show here for illustration, only 25% of the traffic is from repeat orders (returning visitors). 75% comes from new visitors placing new orders (again, a sign of continued growth). If those 75% were not addressed (in the design and “customer experience elements”) then the sales would be drastically reduced and the growth would not be as dynamic. Instead, 7.5-8.5% of those new customers are converting to new sales each month. This is one reason you see such a jump from November ’06 to December ’06 in sales revenue. The traffic to the site was increased based on the data gathered during the first few months of operation, and that caused the jump. In fact, the site’s conversion continues to raise and is currently sustained at 9.61% for the past quarter. Once you get conversion rates sustained, it then becomes a matter of making small refinements, driving more traffic, keeping in contact with your current customer base, and putting the proper offers in front of the visitors arriving at your site. 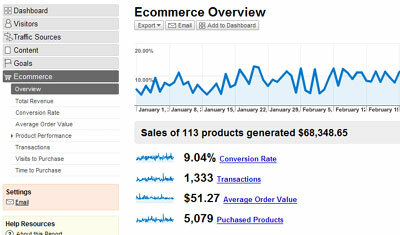 how did you get that cool sales report in the admin of ur zencart? Using the Sales Report contribution found in the Zen Cart downloads section. Great piece on cart best practices and increasing sales. We have found many of the same things during our research. The proof is great, but I didn’t see mention of very many best practices. Thought your readers who enjoyed this post might also like our Shopping Cart Usability & Best Practices article, there’s 21 practical tips for improving sales, service and increasing conversions. Hope others like it! Just a quick note. Anyone that hasn’t been over to eCopt’s blog should take a look. They got some great stuff over there. I frequent it myself. The link to their post is a great article as well.